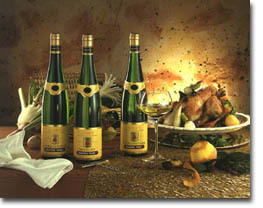 Produced from an even stricter selection of grapes, both by origin and by level of maturity, "Hugel" Tradition wines display increased depth and personality. Made only from the four "noble" grape varieties, these wines have enhanced potential for ageing in bottle. From local vineyards with mainly clay soils, this wine is the ultimate expression of true varietal type. Sensationally suited to rich, spicy dishes, it can equally well be enjoyed on its own. Produced only in the best vintages, this wine proves that finesse and elegance can go together with strength and richness. Perfectly matched with a noble fish dish, or white meat, with white wine sauce. Rich and rounded, although still dry, it is ideal with terrines, white meats and fish in sauce. Of all the Alsace varieties, Tokay Pinot Gris has the greatest ageing potential. A very dry wine with pronounced grapiness, giving the impression of biting into a fresh Muscat grape, it is perfect as an apéritif and with asparagus.